Garage located in Over Tabley, near Knutsford in Cheshire. Homepage. This page: Mr Smith is invoiced for work done to his autocycle and an unidentified Ford car. T. Walley - Motor Engineer. 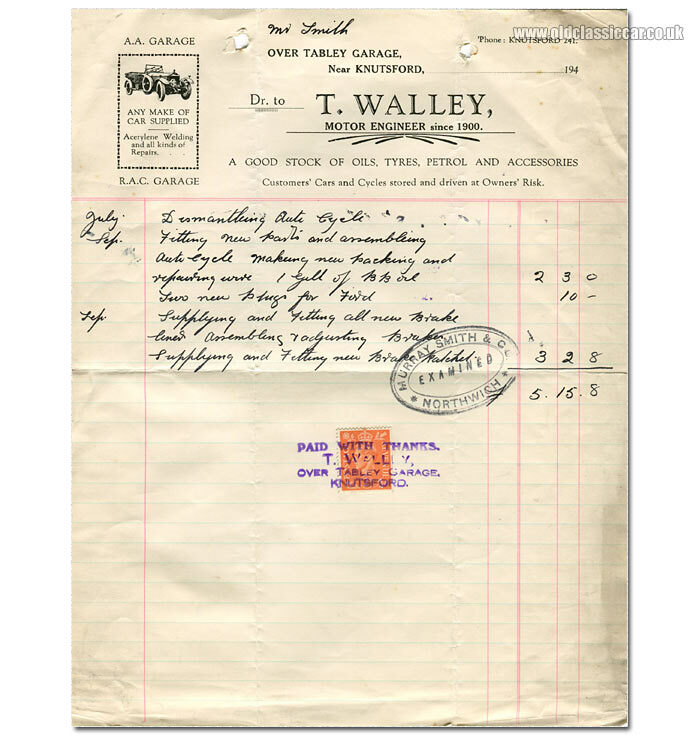 Mr Smith frequented a number of Cheshire garages in the late 1930s and early 1940s, this invoice for instance relates to his purchase of an Austin 10 at Four Lanes Garage in Northwich. Here though he's using the services of Over Tabley Garage, just a short hop down the A556 between Northwich and Knutsford, still in Cheshire. No specific date is mentioned on this piece of paper, but it's pre-printed with "194 " suggesting, if the other items of paperwork are anything to go by, that this invoice relates to work done in the early 1940s. The engineer working from the garage at the time was a Mr T. Walley, "motor engineer since 1900". In addition to servicing work, he could also supply oils, tyres, petrol and car accessories, in addition to "any make of car supplied". The illustration is of a vintage Rolls-Royce. The garage was both A.A. and R.A.C. approved, and features (as "Tabley Garage") in the 1928/1929 R.A.C. Handbook, under the names "J. & T. Walley". However in the 1949 Handbook the same garage is listed under the operation of a C.R. Clark, so presumably Mr Walley had retired by then. Whether the garage is still in business I'm not sure, there is a petrol station at Over Tabley close to J19 of the M6 so perhaps it's at the same location. The invoice relates to work done on an unidentified auto cycle, which involved a certain amount of dismantling, replacement of parts, then re-assembly. There's also a mention of "new plugs" and brake work done to a Ford. A stamp for Murray Smith & Co. of Northwich features, although that firm's involvement isn't clear - perhaps the company's accountant?